In Microsoft Dynamics NAV 2016, Microsoft has introduce some new keyboard shortcuts. You can find full list of keyboard shortcuts here. The following table describes the keyboard shortcuts that are available from the C/AL Editor window. 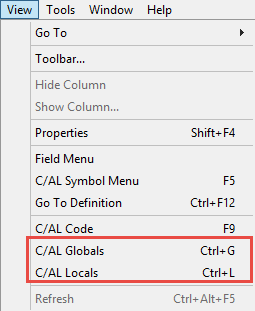 Ctrl+G Open the C/AL Globals window to view and declare the global variables, text constants, and functions in the object. Ctrl+L Open C/AL Locals window to view and declare local variables and text constants for the current function or trigger. Ctrl+J List all members (as IntelliSense) for the local scope. Ctrl+Space List the members (as IntelliSense) for global scope. Ctrl+U Make the selected code lowercase. Ctrl+Shift+U Make the selected code uppercase. Ctrl+Shift+N Expand all collapsed code. Ctrl+K+I Display information about C/AL symbol (such as variable, functions, and parameter) in which the cursor is positioned. This displays the same text as when you point to the element. The following table provides an overview of shortcut key combinations in the Microsoft Dynamics NAV Development Environment. The following table provides an overview of shortcut key combinations in the Microsoft Dynamics NAV Windows client. Shift+left-click On multiple column headers, the columns will all be sorted in the same ascending or descending direction. Shift+double-click If sorting on multiple column headers using Shift+left-click, use Shift+double-click on the first column that was clicked on and this will toggle ascending/descending direction of all the columns included in the sorting. In NAV 2016 both the shortcuts are working, but I can feel that new shortcuts are more faster then older one. Microsoft has keep both the shortcuts in NAV 2016 but may be in next version we don’t have older shortcuts. So start using new(faster one) shortcuts…!! !